Another Thanksgiving season is nearby, and it’s surely great to take a break from the hustle and bustle to spend more time with family and be thankful for new days. Usually, there are tons of good things to enjoy throughout the holiday, but it also means you have to work up pretty hard to prepare for all the coziness happened. 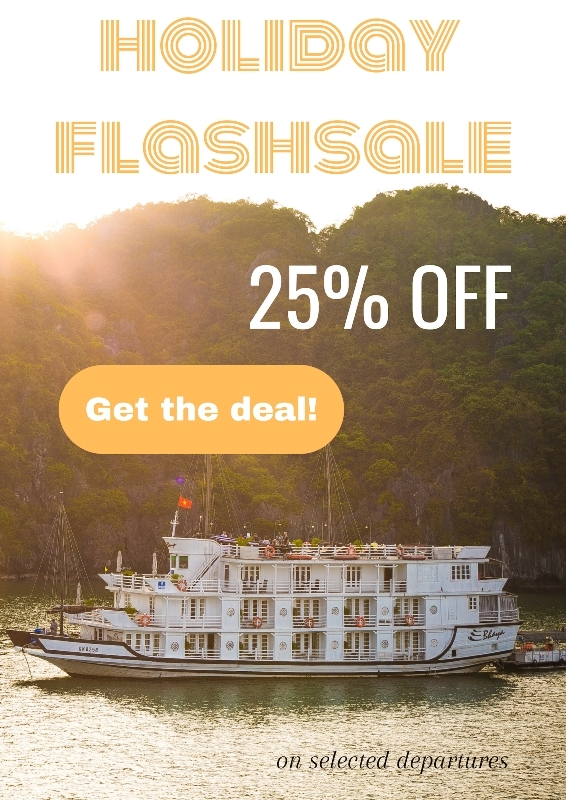 Instead of staying at home and being stressed out with to-do-list, how about booking a cruise in Halong Bay with your family to savor an absolutely jubilant alternative of Thanksgiving, with no sweat. Admit it, your house is not squeaky clean all the time because everyone is so busy nowadays, and perhaps brief weekends allow us to only recharge before returning to the wicked cycle of life. Only when the holiday comes near, we start freaking out because there is nothing ready to welcome guests. If spending Thanksgiving on a cruise, all you need to do is to enjoy the sundeck in the afternoon and show up on time for different activities. Let’s talk about the Thanksgiving feast. Preparing it for the whole family can be exhausting since it takes days. And not everyone is confident in the kitchen so missing out some tiny details might be a fuss. It takes so much time in the grocery store to make sure we have all the necessities, let alone the long line of the people who are doing the same things as we … So why not getting straight to the best part – eating! And the awesome thing is the people who prepare us sumptuous meals are professional chefs. Although there might be no traditional dishes of Thanksgiving, you are offered with dozens of other appealing options made of diverse cuisines. The most important part of Thanksgiving is to be with your family and to give your generous thanks to life. Food is merely a means to bring people closer. Therefore, take advantage of the diversity and emerge the tradition within. Oh, the cooking is said to cost effort, but at least it relates to creativity and producing beautiful dishes for your family. Hence, it is still cool to be a part of the cooking gang despite the hard work. Washing the dishes, on the other hand, is another story. Anyone can easily do the dishes, but truly and deeply, no one loves the job. It is laborious. The dishes during Thanksgiving meals are indeed larger than usual, and doing them won’t be your responsibility if spending time on a cruise abroad. The staff will whisk away your plates and make sure everything is according to your wishes. Simply enjoying some desserts or stargazing on the deck is now what you do. Besides exciting activities to join in all day, plenty of board games are provided onboard for you to have fun with your family, from Monopoly to Battlefield, you name it. Besides the board games, Bhaya Cruises also organize squid fishing at night, which any guest can be a part of to not only do a cheerful activity but also to get to know each other more. 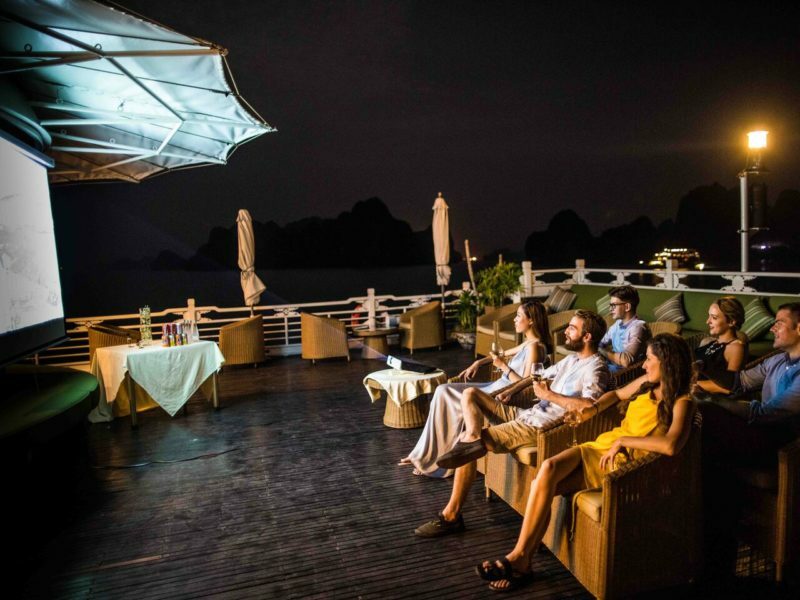 For those who prefer a less adrenaline act, a movie night on the sundeck will be ideal. The outdoor cinema is very unique with open space, and if you’d like some snacks or drinks, the bar is right there. 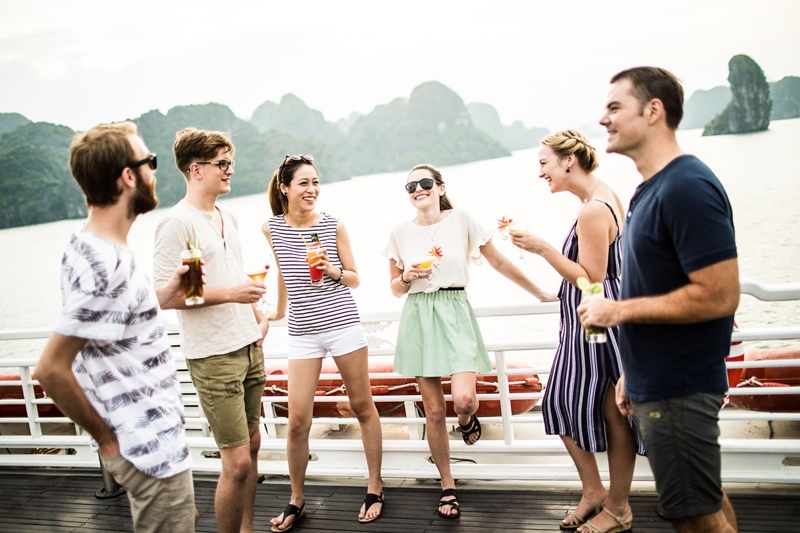 Actually there are many things for the whole family to participate in, and more importantly, you will feel closer to Vietnamese local culture. 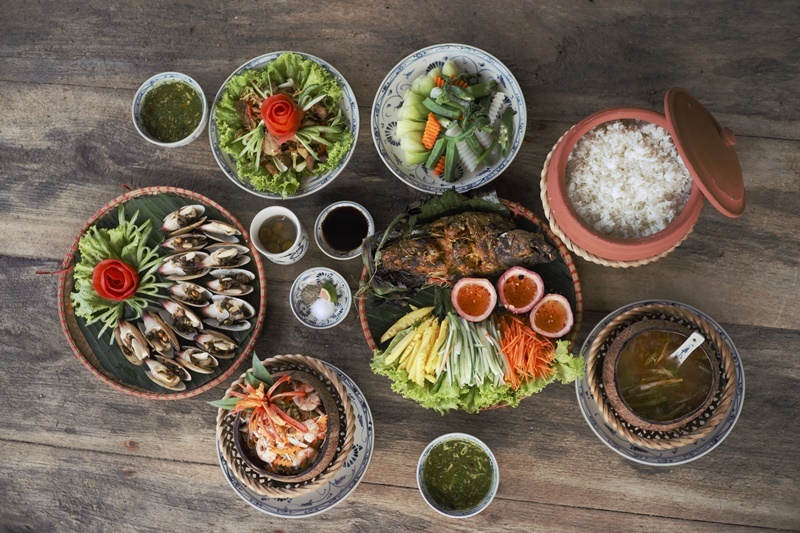 Food is the main way to introduce about the legend of Halong Bay, then, there is Master-Chef Competition that you may try out making Spring Rolls and even win gifts! 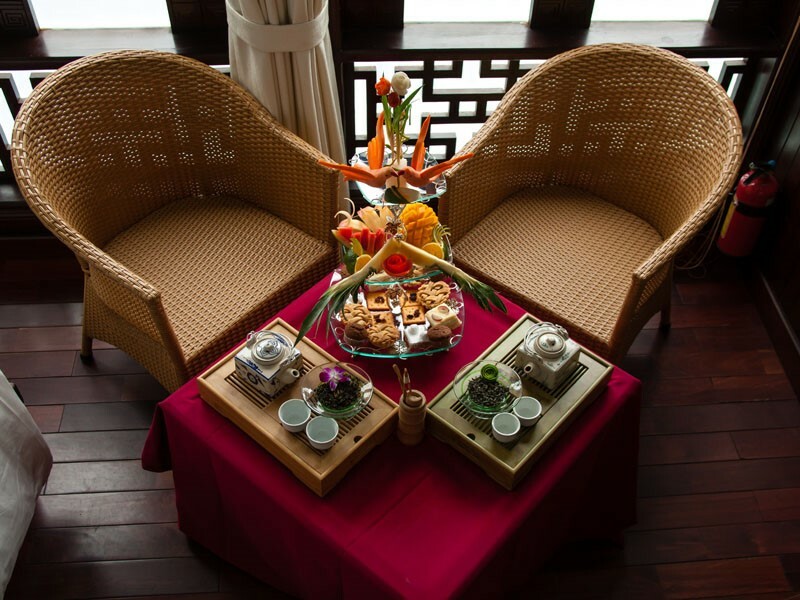 Tea Ceremony allows you to see a ritual of typical Vietnamese households in the ancient time: how to serve proper tea to whomever first and the meaning behind all steps. 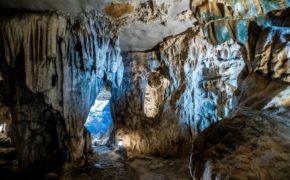 When coming to Tien Ong Cave, you will be stunned by its primitive charm. Tien Ong has recently been open to the public. Therefore, it is much less crowded and better preserved. 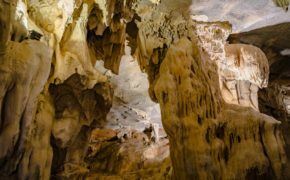 The scene both inside and outside of Tien Ong Cave will make your pictures more worthy. 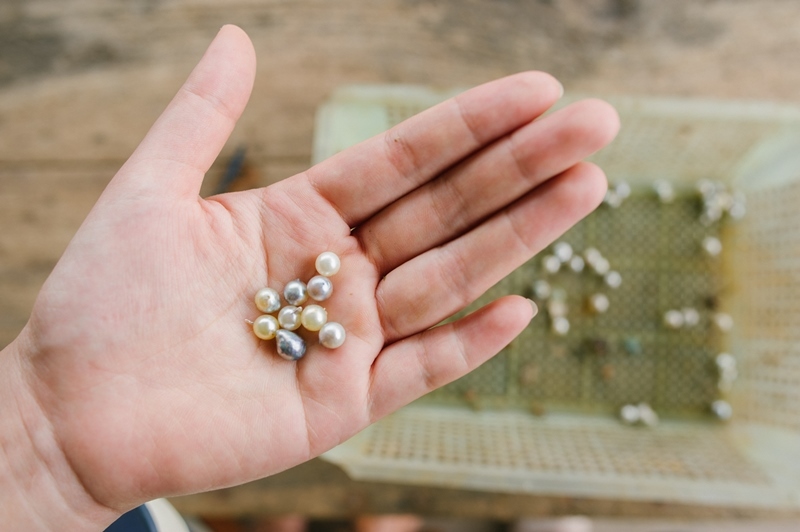 Visiting Tung Sau Pearl Farm is another engaging activity, where you will see how a valuable pearl made from the first step. The unique thing about Tung Sau’s pearls is the combining method of Vietnamese handicraft and Japanese technology. Your mom, wife, or sister might be fond of Tung Sau the most. Halong Bay is pretty all year round, but it is the most beautiful from November till February. 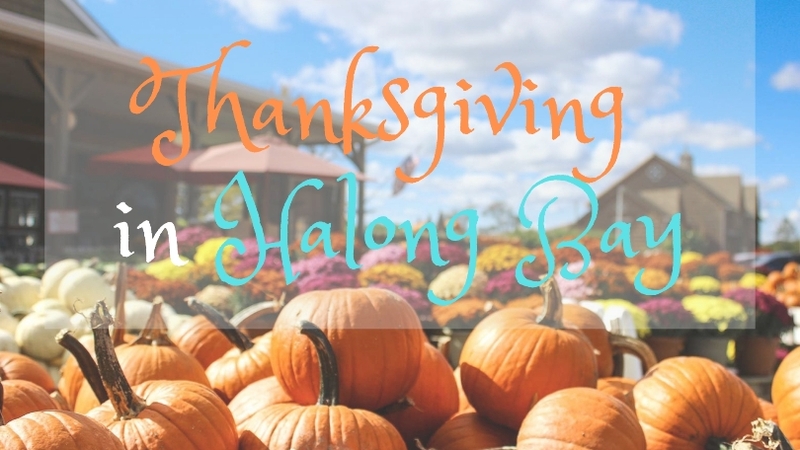 The timing just matches with the close operation of most schools and businesses, which is a long weekend over the Thanksgiving holiday. This will allow you to do a longer traveling time without sacrificing all your vacation days in one shot. 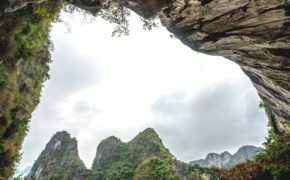 During this time of the year, Halong’s weather is incredibly stable with no rain or humidity. It will be perfect for you to do outdoor activities and the warmer sea currents create a perfect condition to chill on the sundeck anytime. Many great reviews about Viet Hai Village and Cua Van Floating Fish Village have recommended other expecting guests to “must” pay their visits in these places. Each village hints local culture of Vietnam, which is an opportunity for you and your family to be educated of. 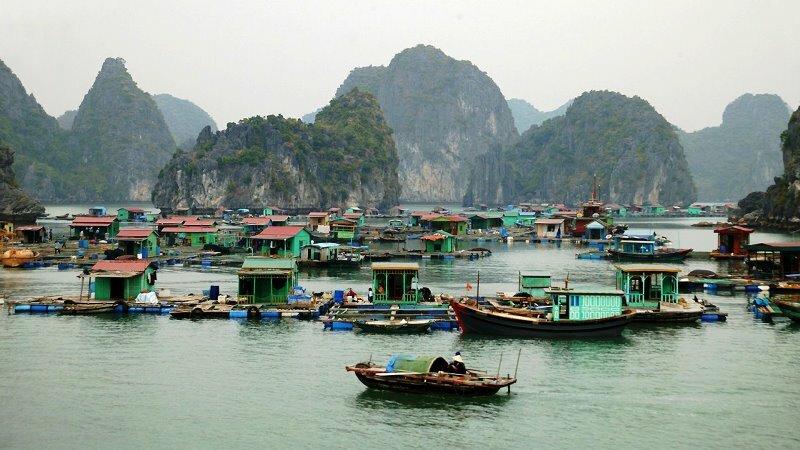 Viet Hai Village is situated in Cat Ba Island, facing toward Lan Ha Bay, which is further down below of Halong Bay. The village is very small and isolated, yet its quiet beauty has seduced many guests all over the world. 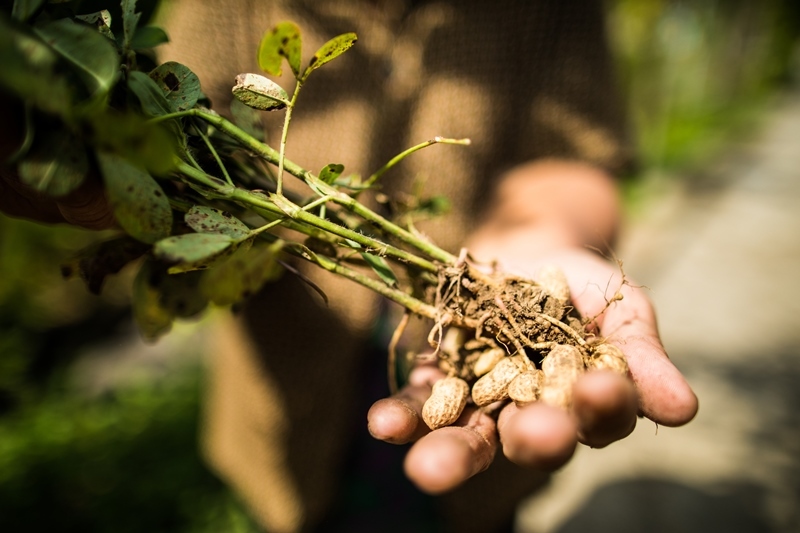 Viet Hai Village is now the home of about 80 households that farm organic foods to be served on every Bhaya cruise. Here, you will be able to visit the whole farming process, see how the locals living, and bike around this wonderful island. 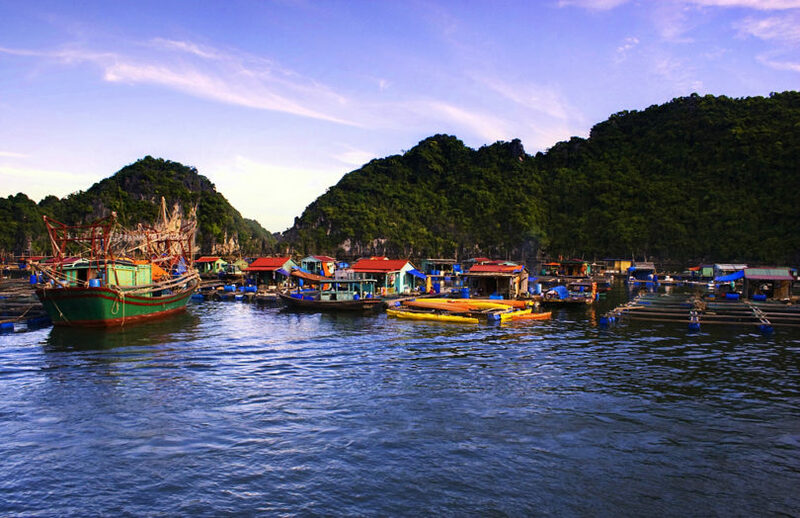 Cua Van Floating Fishing Village is humbly located in a very calm water area of Lan Ha Bay. No matter how stormy it is in the sea, the area is still peaceful with picturesque scenery. The water is pristine and the air is wonderfully clear. About 300 people live in this village and build their own colorful floating houses next to each other. It’s amazing to know life has started here since the 17th century with ups and downs: Guests will be able to enter the museum on the floating village to find out more details. 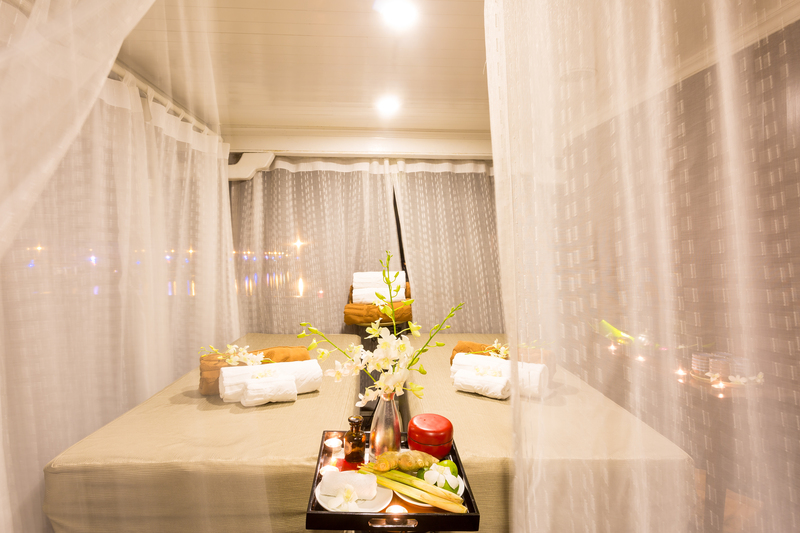 Spending time in Cua Van makes you feel Time being stopped, and it does not matter as long as you are with your beloved. If staying at home for Thanksgiving, gaining extra pounds is guaranteed because your life will revolve around food, sleep, and TV. It sounds great for one day, but then if a whole week constantly being drowned in lazy mode, it is tedious and makes your return to the office 100% harder. 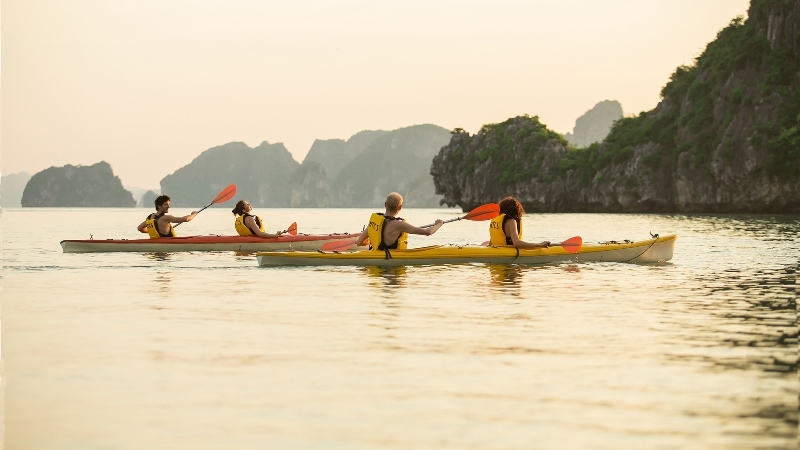 Replacing your inactivity with stimulating activities such as kayaking, swimming, or even snorkeling in different destinations of Halong Bay is a much better idea. 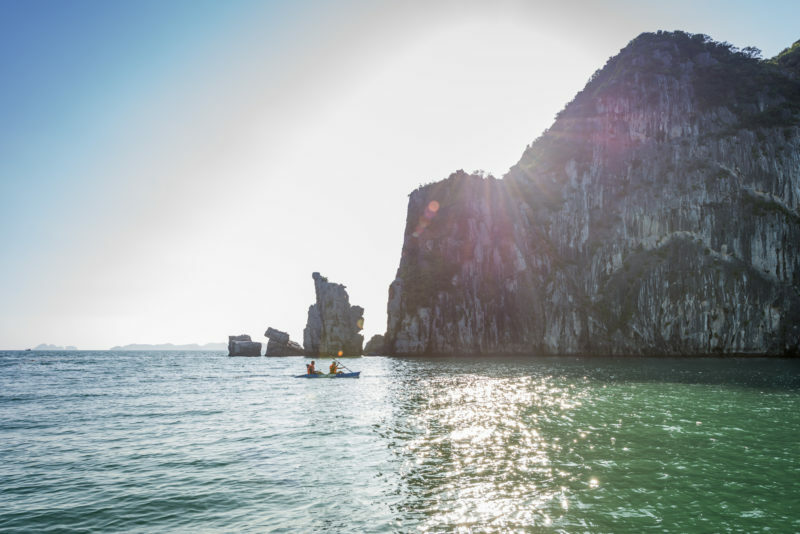 You can kayak in the most pristine areas like Ho Ba Ham or Ba Trai Dao, and snorkeling underneath the teal water to see in person coral reefs with the surrounding of karst limestone mountains. Do you know there’s often a post-holiday letdown? Apparently, it won’t be on a Bhaya cruise! Staying away from the big cities might restrain you from over-shopping, but absolutely offer the most relaxing retreat in the world – spa. Whichever better is to get some massage amidst the vast nature of the Bay. Last but not least, you will meet up with many new friends from all over the world. Surely, you will have lots of chances to share stories and perhaps keep in touch after the cruise. In addition to different activities above, Happy Hour will be a great time for guests to get to know each other while enjoying Bhaya’s refreshing cocktails!